Recently, a person emailed me (kartbuilding[at]gmail.com) asking about the “factor of safety” (FoS) required when undertaking calculations to design and make a go-kart. The “factor of safety” is the maximum force and stress a kart can possibly undergo, multiplied by a suitable factor/multiplier. Ideally if the maximum force and stress a kart can endure is calculated, then this factor gets multiplied by the factor of safety. Having a FoS of 1, means that a Go-Kart is not “overengineered”, and nothing extraordinary will occur. It is when the “extraordinary” or unthinkable happens, that the FoS comes into effect. Quantifying the FoS for a Go-Kart is not an easy task! It certainly cannot be applied to the entire Go-Kart, but parts of it, e.g. the chassis, transmission, brakes, etc. The same FoS cannot be applied to the chassis in every Go-Kart. The purpose and category of Go-Kart must be firstly determined. I.E. is it a racing kart and in what category of racing kart? Once the category and type of Go-Kart is determined, then a FoS can be obtained. The chassis in general shall be of safe, sound and adequately strong construction and shall not include any components of a temporary nature. Specifically, the wheel base is to be a minimum of 101cm and maximum of 127cm. The maximum length of the kart, including bodywork shall not exceed 210cm. No kart is to weigh more than 100kg without the driver. I highly recommend that the NatSKA handbook and regulations are read and followed, especially if other people are driving and racing your Go-Kart. At the very least, excellent safety guidelines are outlined. If you are designing your own Kart on a CAD system etc. some software will allow you to carry out “Stress Analysis” of components. 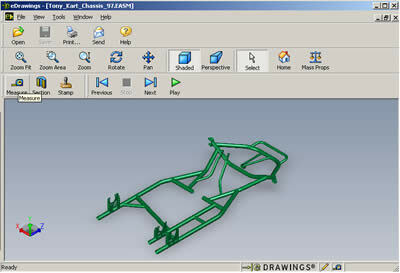 Some examples of CAD software packages are: Solidworks and Cosmos, Pro-Engineer and Pro-Mechanica. These software packages will allow you to carry out simulation of kart components, allowing you to place particular loads throughout, and calculate a FoS automatically! If you are heavily involved in design and analysis of karts, this CAD software will speed things up, and provide a wealth of information. As an example of the amount of information and the ease at which CAD software can calculate the FOS, a stress test was carried out on a Front Stub Axle from a Go-Kart, as can be seen in the image on the left. The entire CAD HTML Stress Analysis is also available. 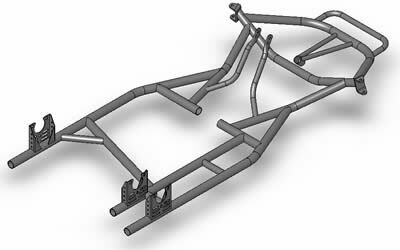 The plans for this “Front Stub Axle” are contained in the Complete Set of Racing Kart Plans. This test, taking a total of 10 minutes to model and analyse, found that, if a loading of 50 kilograms were placed onto the steering arm, that the resulting Factor of Safety would be 1.466. Therefore, this Front Stub axle is slightly overdesigned. An in-depth knowledge of the individual forces involved in a Go-Kart would be required for an entire Stress Analysis. The speed of an adult kart shall be limited or governed so as not to exceed 45 kilometres per hour. R.R.O. 1990, Reg. 20, s. 40 (2). 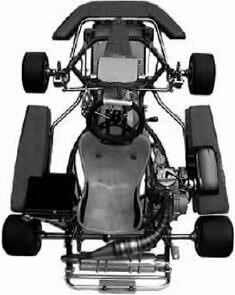 The seat, back rest and leg area of every kart shall be so designed as to retain the driver inside the kart in the event of a collision at the front, rear or side of the kart. R.R.O. 1990, Reg. 20, s. 41. Rotating, moving or hot engine parts of a kart that may constitute a hazard to an occupant of the kart shall be shielded to prevent burns to the occupant or the entanglement of the occupant’s hair, hands or clothing. R.R.O. 1990, Reg. 20, s. 42. The wheels of a kart shall be so enclosed or guarded that the wheel of one kart cannot interlock with or ride over the wheels of another kart. Various universities are taking part in “Formula Student” lots of readily available information about building advanced racing Cars is available. Two excellent reports on designing formula racing cars can be found here and here. The latter document has a section on “Factor of Safety Development”. The materials used, and the forces involved make the calculations for FOS quite difficult. CAD software makes things much easier, allowing you to select the materials from a drop-down menu, and allowing you to apply forces wherever you require. CAD software will also allow you to change material thicknesses to achieve an optimum FOS, and weight balance. Using your common sense, and reinforcing areas which would potentially fail in a collision will go a long way in having a robust Go-Kart. If you have any queries or questions, drop me an email or leave a comment below.